Beverly Raymond’s quiet and subtle influence on the horse community in Maryland will last for generations to come, and it is for this reason that the Maryland Horse Council will honor her with the Anne and Gilbert Pumphrey “Unsung Hero” Memorial Award. During their lifetime, Anne and Gilbert Pumphrey also had a subtle yet oh-so important impact on the Maryland horse community particularly as two of the founding members of the Maryland Horse Council. In honor of them the Maryland Horse Council established this award to honor the behind the scenes efforts of these unsung heroes. The first recipient of the Pumphrey honor was Dorothy Troutman for her efforts in helping to establish the world renown Prince George’s Equestrian Center. In the same vein as the Pumphreys and Dorothy Troutman has been Beverly’s quiet and persistent presence in the horse community. In her role as the State Stable Inspector, Beverly has been a friend and mentor for many a neophyte boarding and riding stable owner as they learn to master the challenges of caring for a large herd of horses. With her almost daily travels around the state, Beverly has long been a link of communication, helping to make Maryland a better place for horses and horsemen. And always with a smile and a warm word of encouragement. 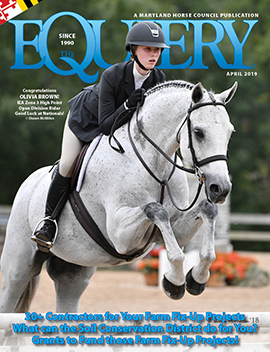 Beverly is an accidental equine professional having never intended to have a career in the horse industry. She started riding as a child when her father used to take her to a local hack stable. When she got a little older, she worked in a local riding stable, Circle H, mucking stalls and tacking up horses for the riders, for which she received free rides in exchange. Without ever taking an actual riding lesson, Bev, a voracious reader, learned to ride through books “I and learned how to post from the Cavalry Manual on the back of our sofa!” recalls Bev. For her 16th birthday her parents gave her her first horse, a horse she picked out, an infamous bolter named “Stampede” that Beverly was going to “re-hab.” “I think the only reason I was able to re-hab him is because I just rode the legs off of him every day!” explained Beverly, laughing at the memory. Eventually, the family got a small farm complete with a 300 year old stone house for the now growing herd the family had acquired. Beverly, while working as a legal secretary started a small boarding operation to support the horses. When one of her boarders started taking lessons at her place with Jim Monie, Bev joined in and had her first riding lessons. Soon, that the whole barn was taking riding lessons with Monie (still a close friend of Beverly’s), and not long after that, they started eventing. Beverly was an early member of MCTA, as well as the Maryland chapter of the Professional Horsemen’s Association. Meanwhile, to keep a friend company, and because it sounded interesting, Beverly enrolled in the recently established Maryland Animal Hospital Technician Certification program. When another friend who worked part time as an inspector for the State Board of Inspection for Riding and Boarding Stables was ready to move on, she recommended Beverly to take her place. With her years of experience running a boarding stable and caring for horses, as well as her Animal Hospital Tech certification, Beverly was just the person for whom the program had been searching. Soon, the programs were moved to the Department of Agriculture, and Beverly was given a full-time position inspecting both stables and animal hospitals, and since the late 1970s, Beverly has been a kind and able force in the community, assisting stable owners in the quest to provide good care for their horses. 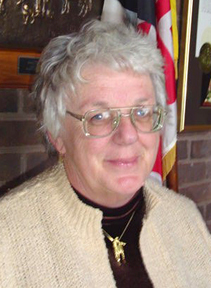 Just as she has been a quiet and persistent storm, promoting and educating good and humane care for horses, she has been a quiet and persistent storm for the Maryland Horse is Council. A founding member since 1984, Beverly has been dedicated ever since to the mission of the Maryland Horse Council: the protection, promotion and perpetuation of the Maryland horse industry. Always one to be able to see the forest for the trees, Beverly quietly and persistently helped other horsemen to also “see the forest” and join the Horse Council. Always willing to do the tasks no one else wants to do. Beverly operated in a variety of roles for MHC, as cheerleader when interests waned, as chair and organizer of whatever committee needed her, and as treasurer for the last 6 years, under the presidencies of Rich Wilke, Elizabeth Madlener and Malcolm Commer. Quiet, and always maintaining a low profile, Beverly planted the seeds that today have blossomed into such mainstays of the community as Horseman of the Year, awarded at the Annual Horsemen’s Party and the “Maryland Horses With Pride” booth at the State Fair. She helped launch “Maryland Horse Month,” a program with the Department of Employment and Economic Development (DEED), which later got slashed in government in cutbacks, but which she fervently hopes to revive. Beverly has the unique ability to see the long term good in programs, despite the short term hassles, and to support them, not only with words but also with deeds, giving of herself and of her time to programs such as the Volunteer Mounted Patrols and the recent United Way Pony Express Campaign, which garnered $4.5 million dollars in just one day. “If anybody had any idea how much this woman does,” declared old friend and supporter Debbie Rollins-Frank of Rendez-Vous Farm “…well, it’s just incredible. Whatever needs to be done, she’ll do it, whether it is to bring refreshments for a meeting or lead a committee, all this while taking care of a farm and a sick father… her quality of giving, her volunteerism it s a lost art. I don’t think I know a kinder, more giving, more Christian gal then Bev”. MHC will sing the praises of this unsung hero March 6 at the Maryland Horsemen’s Party at Pimlico Race Course.